Dancer, bailaora, choreographer and dance teacher. Professionally dedicated to this art since 1982. Born in Madrid, her calling to dance was obvious from an early age and began studying Spanish Dance in the Madrid Conservatory at age 12. However, it is in Flamenco where she found her true form of expression. In 1980 she went to the United States to increase her cultural and artistic knowledge. She had the opportunity of studying modern and jazz dance in the Boston Conservatory and participated in several artistic activities sponsored by the Spanish consulate. Upon returning to Spain she devoted herself to Flamenco, studying under the most important teachers who created a style in the field, such as Ciro, Paco Fernández, María Magdalena, José Granero. She joined the “Teatro del Arte Flamenco” Company, touring Europe and working alongside with important Flamenco personalities such as Chaquetón, Juan Maya “Marote” and Tomás de Madrid. Her professional growth took place in several Spanish and Flamenco dance companies, among them those of Rafael de Córdoba and Antonio Gades. She traveled to Japan with her group representing Spain in the International Music and Dance Festival held in Nagasaki. She directed the Flamenco portion of the show “Tres Culturas, Tres Músicas, Tres Pueblos” (Three cultures, three types of music, three peoples) represented on stages of Castile and Leon. In 1992 she formed her own Company and created the show “Al son del Aire”, which opened in Madrid in the Dance Tribune of the Fall Festival. This show was followed by “Flamenco y Palabra” (Toledo 1999) and “Dímelo tú Flamenco” (Salamanca 2002), which toured all overs Spain and in several European and African countries. “El Dibujo de mis Abrazos” is her most recent creation, first performed in Madrid in the spring of 2012. This is the show she is currently performing. From her earliest years as a professional dancer, Isabel Olavide has combined her artistic stage activities with her work as a Spanish and Flamenco Dance teacher. She has taught in several studies and academies in Madrid, including “Estudio Carmen Cubillo” “Estudios Relatores” etc. 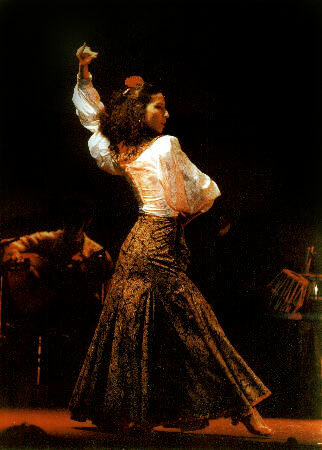 In 1993 she created her own Flamenco study. It was there that she had the chance to form a group comprised of children with Down’s syndrome and other different abilities. This defined the trajectory of the school and set its lines of action. Making dancing an inclusive artistic activity. Developing the teaching of dancing, in view of its great transformative (therapeutic) power. Transmitting it with discipline, from the joy and thrill of dancing and the profound love for the art that her vocation has always inspired in her. At this time the school has several different groups and levels, with over 30 students with ‘different abilities’. As a result of this pedagogical work performed in these years and in view of the evolution and progress in the learning and artistic trajectory of her students, Isabel Olavide has created a company that reflects the artistic talents of its performers. She directs several shows performed by this Company: “Al Revuelo de tus Volantes”, “De mi..........pá ti”, “Rumbo al Sur” and “A Nuestro Ritmo”, which have been performed in various Occupational Centers and cultural venues in Madrid. The experience gained in these years of contact with the world of ‘different abilities’ has led Isabel Olavide to develop several teaching and learning methods and to teach courses in psychomotricity and dance therapy for professionals, educators, dance teachers and other people involved in artistic diversity. Fully committed to this artistic, creative and pedagogical work, she hopes to continue developing different projects in the world of dance, an artistic language that contributes so much to humankind.